Today’s smartphone industry is controlled by giant tech companies with impenetrable black-box devices running proprietary software, who engage in patent lawsuits and baby-panda eating in their spare time. This last claim may not technically be true, but I figure it’s election season, why can’t I get in on the fun? He’s not dead, he’s just pining for the fiords. It happens to be a very handy beer opener. And an extremely sturdy beer coaster. Remove the battery and you’ve got a sneaky mini-safe to hide valuables and foil burglars. Works beautifully as a spy mirror. Or a makeup mirror, if you’re that kind of spy. As a bookmark it leaves no room for confusion. An invaluable companion while woodworking, its ergonomic form creates the perfect sanding block. I’ll keep you posted on my progress resuscitating this Open Phoenux, and if you’re interested in this area, keep an eye on developments with the free software operating system Firefox OS, and also the Fairphone initiative to bring more transparency, choice and accountability to phone production. Author samoosPosted on November 9, 2012 July 28, 2014 Categories Mobile, Shareable2 Comments on Does Anyone Know Smartphone CPR? Last week I was lucky enough to be at the Open Knowledge Festival in Helsinki – 4 incredible days of workshops, talks and hackathons bringing together some of the best ideas and brightest minds in the fields of open government, science, education, hardware and data. Trying to live as ‘open source’ as possible does present plenty of challenges when travelling. What to do about open source accommodation? We stayed with kind and generous locals via free hospitality exchange: BeWelcome is the open source option, non-profit, democratic and transparent– Couchsurfing is none of these, but it has the biggest user share. With two of our hosts in Helsinki! Hospitality exchange is the best way to get an insight into the local culture (and learn about the Moomins). Want to know why there are slot machines in all Finnish supermarkets? Or what blueberry soup tastes like? 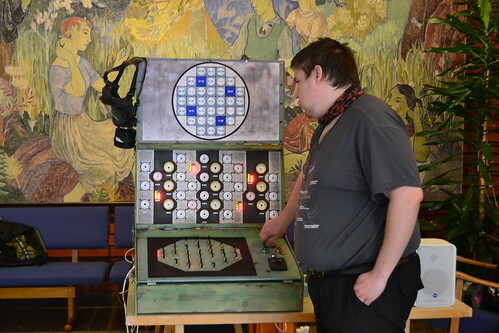 Want to see a Chernobyl simulator inside the Helsinki Hacklab? Then go to Finland, and stay with a local! I knew transport would be a difficult problem to solve. Up until now I’ve just been riding my old-style 1-speed patent-free bicycle to get around Berlin, but leaving the city meant I had to look elsewhere. Openness in transport can be at various different levels – you could drive an open source car, fly an open source plane, you could share a vehicle, or simply share a ride. My attempts to find the ‘shariest’ option to get to Helsinki from Berlin proved to be somewhat of a failure, only managing to ride-share one leg of the journey. But as it turned out, the festival itself was the ideal place to find out more about the possibilities for the future. One recurring theme at this conference was open data. Information collected by governments, NGOs and companies, released openly in machine readable formats. Open data presents an opportunity to compare statistics, to make graphs, apps and maps which allow us to better understand the world and see what needs improvement, to base our understanding on facts rather than impressions. Transport companies, the heart of a city’s circulatory system, hold extremely important data on how the city works, in terms of passenger volume, timetables, delays, access to neighbourhoods and energy use. The festival included 3 days of fascinating discussions and presentations on the developments and challenges of Open Transport. Helsinki even offers a great visualisation for the efficiency of bike parking. Helsinki was the ideal place for such a discussion – for a country with an astonishingly incomprehensible language, the Finns do have a very clear public transport system, and it’s a great example of open data in action. Helsinki Regional Transport’s timetable and realtime information is shared openly for anyone to build upon. You can mix this data with anything else you like – air pollution or noise levels – crime or economic activity, rent prices – and you start to have a clearer understanding of a city. A great advantage of opening up data as a company is that 3rd party apps can improve customer experience with your product. There are now apps which tell you exactly where every tram in Helsinki is right now. In fact it’s got a little ridiculous – Helsinki has only one metro line, but you have the choice of 35 mobile apps giving updates, mashups and realtime information to help you navigate it. Good data can allow you to check-in using location-based services on a moving vehicle, not with GPS but with interpolation of timetable information. You could link transport data with special calendar events or weather, and work out when demand is likely to be high. Info on delays or heavy use of transport could be relayed to other users. Some of the apps presented during the Open Transport Helsinki talk. It’s not just Finland – in Sweden the government now requires all transport companies to open their data through a central agency. One man’s polite, patient but persistent inquiries built a British rail database, and now the government is trying open transport data itself. The United States has a comprehensive Open Transport Data plan, and iRail.be is working on making sense of every train connection in Belgium, the Netherlands and part of France. This isn’t a universal movement yet – I live in Germany, where organisations love the idea of modernity, but can’t quite bring themselves to follow through. The raging desire to be high-tech suddenly gets all soft and pulpy when faced with abandoning the pure certainty of print on paper- this is a country where you can fill in your whole tax form online, before you print and send it by post. My online banking service requires a printed paper code to run. For most companies, an ‘Online-Portal’ means a personalised login, to request which account details you would like to see – they can be mailed to your door early next week. So no surprise there’s a lack of imagination in official channels when it comes to open data. Open data on Berlin’s transport website- No results found. Deutsche Bahn has hardly begun the slow, iron crank into the 21st century, and Berlin’s 90 miles of underground trains are served by a single basic, officially sanctioned app. No offline version for tourists or others who aren’t connected. No extra mobility information for wheelchair access times; no easy analysis of infrastructure for city planners; no calculation of energy consumption or carbon footprints. No opportunity for integration with OpenStreetMap or OpenTripPlanner. And most importantly, no compromise shown to campaigners trying to prise this data from the city transport agency’s rusty old vaults. Some frustrated open data activists have started to give dark and dusty German institutions a push into the light, whether they like it or not. A couple of weeks ago Michael Kreil and others finished what I can imagine was 3 weeks of intense copy-pasting, working to scrape what useful data they could from publically available Deutsche Bahn PDFs and the Berlin transport timetables, publishing a clean dataset for others to build on. The hope is that others will use this data to build visualisations, reports and online applications and show these creaky old companies how valuable opening their data could be. Just to get you started, here’s a mesmerising 30-second look at Berlin’s public transport network – green dots are overground trains, blue are underground, red are trams and purple are buses. So far the publicity the move has generated seems to be having an effect. Berlin’s transport data may be officially opened by the end of the year. Nationally it might take longer. Deutsche Bahn first responded to the move with a gruff “bah, humbug. We have one of those app things already.” Then the taxpayer-funded corporation last week finally released its data, but not to the public – they signed an exclusive deal with Google. To round out the festival, in a packed keynote address, Hans Rosling encouraged people to ‘demand open data‘ to increase understanding of the world they live in – but when demanding doesn’t work, grabbing, scraping, and collecting data seems the best alternative. Open data, with, or without permission. How open is transport data in your region?